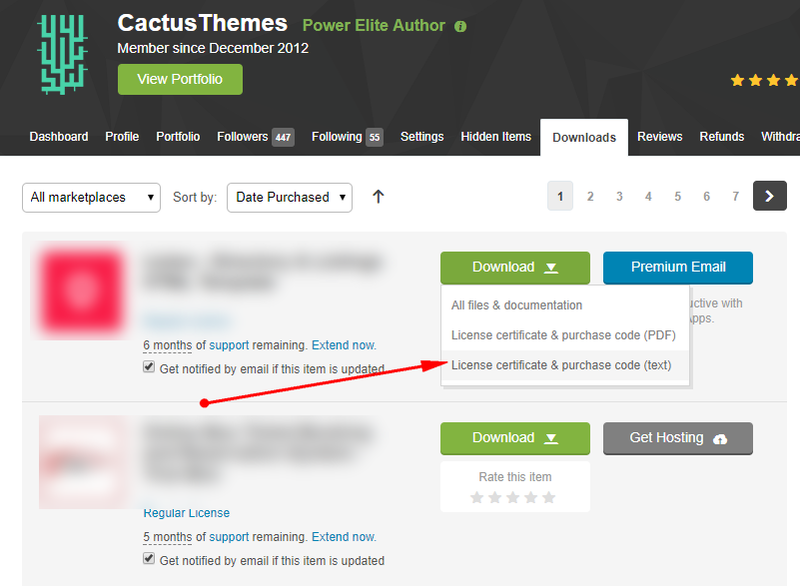 Where is my Envato Purchase Code? To get access to our Ticket System at http://support.cactusthemes.com, where you have dedicated support, you will need a PURCHASE CODE. 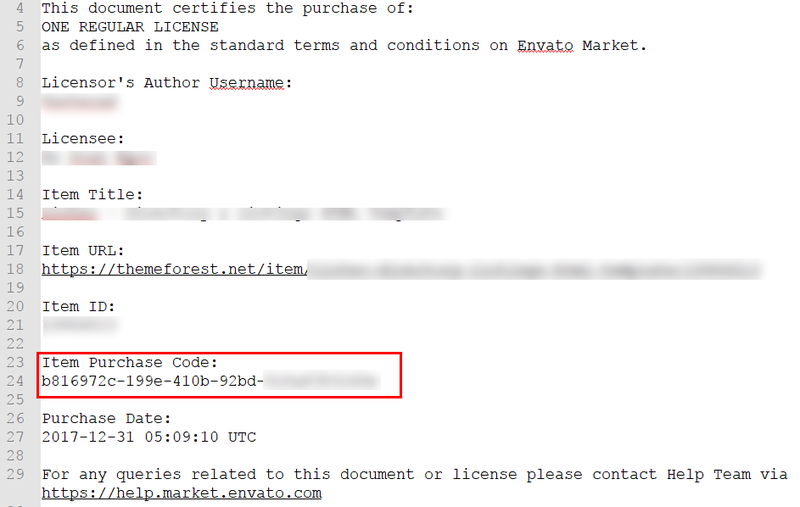 A purchase code is a text string provided by seller (Envato or CactusThemes) to verify your payment of item. It’s not your fault or your theme, it’s related to WooCommerce. They have changed from jQuery Cookie to Vanilla JS Cookie https://github.com/js-cookie/js-cookie in to work with latest version of jQuery in WordPress 4.9+. The updated file is cart-fragments.min.js but tthe minified file (.min.js) is not re-minified. Only the raw file cart-fragments.js has the new code. To fix this error, you can open /woocommerce/assets/js/frontend/cart-fragments.js , copy all the code, and open an online minify tool such as https://www.minifier.org/ to get the minified code. Copy the minified code and replace all code in the .min.js file. Voala, it should work the issue. 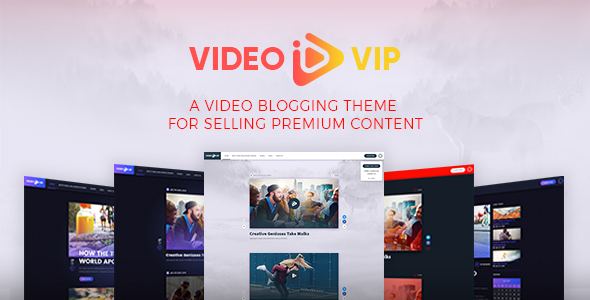 VideoVIP – Premium Video Content WordPress Theme – has just been released recently. It’s our third theme in the video-related category, beside VideoPro and TrueMag. It gives you another choice in building video site: simple to use, easy to setup, and complete package (ie. no extra plugins needed). The main idea of VideoVip is for selling Subscription: you have premium videos and users need to subscribe (pay per months or days) to view those content. 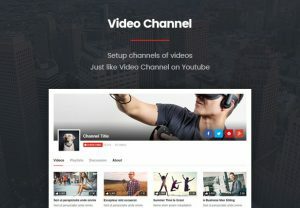 Why you need this theme when you can upload videos to YouTube or Vimeo and earn $$$ via ads? Well, first, you have full control of your site so you can upload any videos as you want. Second, YouTube and Vimeo do not give you solution to sell premium videos via subscription. Using VideoVIP on a WordPress site of your own, you have full control of your vdeos and setup payment as you want. Here is how it works. You setup your payment gateway settings (only once when first install). You upload your premium videos and choose Lock to require subscription. Users who want to view Locked Videos need to subscribe to the payment plan. You can have both FREE and PREMIUM videos at the same time. 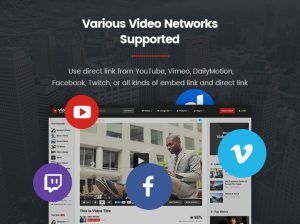 VideoVIP supports YouTube, Vimeo and self-hosted videos. In general, you should use self-hosted videos (ie. upload your own video file to server) for Premium content. No one wants to pay for videos which they can watch for free from YouTube and Vimeo, right? (or do they?) Anyway, a normal scenario would be: you add free videos (from YouTube, Vimeo or upload your own videos) to build content and generate traffic. After having visitors, add premium videos and turn on subscription. 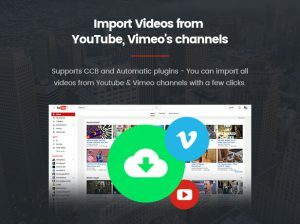 This will be easy in VideoVIP as the package includes a video importer which can import videos from existing YouTube or Vimeo channels. However, if you already have visitors (such as from your own YouTube channel), you can add only VIP videos on your site. It will be your premium content channel besides your free channels on YouTube. For example, a singer who wants his fan to subscribe and view newest videos can use VideoVIP for sure. Fan will have access to latest videos before other ones. One more interesting thing in this theme is that, it supports various video player including JW Player, FV FlowPlayer, BZ Player and Elite Player. They have their own advertising network. So if you don’t want to sell subscription, you can also turn on advertising mode. That’s quite flexible, isn’t it? In our imagination, VideoVip is suitable for personal blogging, video bloggers, video producers, and content creators. However, we believe that you have more use-cases to apply to VideoVip. Please share your idea or suggestion so we can improve the theme. Updated: The campaigned has ended. All of us at the CactusThemes want to thank you for your loyalty and support during 5 years in business. Because of customers like you, we have had an avenue to provide our quality service and to prove our mandate of excellence. We could not have made it in 5 years without our loyal clients, and we hope to serve you even better during the next 5. On this auspicious occasion, we gladly announce a 30% discount on this featured product to our clients and customers. 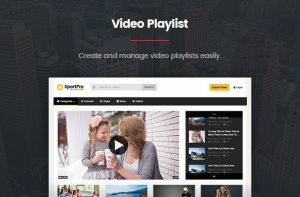 VideoPro – an outstanding theme of CactusThemes is the most powerful WordPress theme for video-based websites. It is built upon our True Mag theme – one of the biggest video themes on market and trusted by more than 5000 site owners to host hundred thousands of videos. 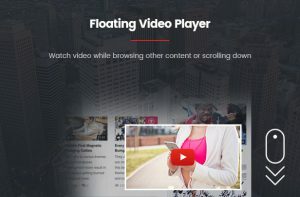 VideoPro has more unique features which helps you to build any kind of video websites. 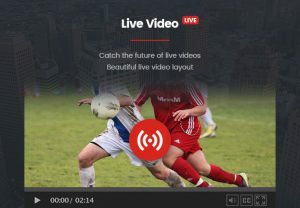 Whether it is about game, movie, news, entertainment, science… VideoPro can do it! VideoPro has many unique features which help you to build any kind of video websites. Tons of features of VideoPro are waiting for you to explore. VideoPro 2.0 – a powerful video wordpress theme includes all the features you have been waiting for to build a community and sell your premium content. No other themes have done this before and we are as excited as you are. 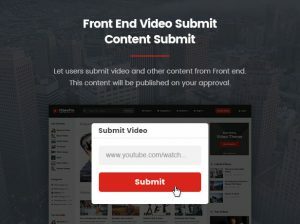 Build your own video community: Members can create their own channels and playlists from Front-End Subscribe Authors and Channels. WPMU Membership 2 Integration: Sell memberships and premium content with this feature. BuddyPress Intergration: Follow members’ activities through notifications. 2 Header Layouts and 2 Color Schemas, Child Theme for Poster Size, 5 Widget Styles, 3 Page Layouts, 3 Blog Layouts, 2 Video Layouts, Ajax Search, Affiliate Features and so much more features. WordPress is a very powerful for building any kind of website and video game websites are no exception. With a plugin like WooCommerce you can sell video games online as an online shop. To attract online customers at the first sight, you should choose one from the best video game themes which is fit your product best. There have always been a huge number of websites online about video game: websites for Game News, Game Reviews, Downloads and Add-ons for games, YouTube Streamers and Twitch Lets Plays, Websites to play games online, website Frequently asked questions and Wikis dedicated to particular games or simply website about your favourite game. Here’s a list of the best WordPress Game Themes available. Each of these themes is both beautiful and feature-rich. Check them out and have the idea for your new own website. These a some of high quality features: Visual composer page builder, Powerful gallery, BBpress forum ready, Full responsive and so much more. Built upon our True Mag theme – the biggest video theme on market, VideoPro has more unique features to build any kind of video websites, especially game website. It comes with tons of features: Video channel, Video Playlist, Video series, Video actors/actress, Live video layout, Floating video player, Video filter, Front-end video submit, Membership Features, Video Ads plugin, Earn money and so much more video features. Oblivion is featured: unlimited colours and backgrounds, BBPress compatible, Rating system, Drag and drop Page Builder, Isotope Gallery, Parallax slider, WooCommerce ready and many more. Moview Theme for WordPress 4.5+. Have you ever wanted to create a website similar to IMDb, Rolling Stone, CinemaBlend, TMDB, Rotten Tomatoes or NDTV Movies. Using Moview theme with suggested extensions allows you build movie database with reviews for new and recent movies in theaters, DVD and Blu-ray releases, and film classics. Your site can be a place where everyone goes to discover new movies, video games, television shows and music albums. Godlike – an atmospheric WordPress game themes. With Godlike you can promote your game, create a community with clean forum design, open your store with WooCommerce plugin. Sell your video games, iOs and Android apps, movies, license game keys, but stop… the theme is not limited only to gaming niche, it can be used in be. 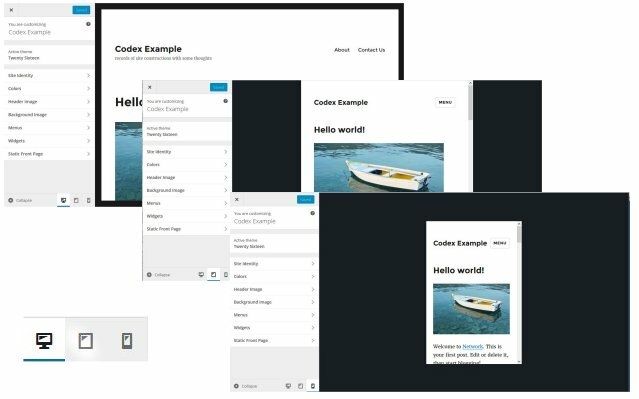 You can build any type of pages with page builder. Write blog posts and share your news. So many shortcodes are ready to use. Unlimited layout variations for everyone. A lot of options to set up your website. And, of course, stunning and modern website design. For free you will get Revolution Slider and Visual Composer plugins. Gamez is responsive WordPress themes crafted for games, movie and music review website. Easy to install and simplified writing interface with lots of option allow you to write beautiful review and earn money by placing affiliate links. Plenty of advertisement placements, video gallery, review and blog makes it ultimate review WordPress theme in the market. Gameforest is a Creative, Fully Responsive & Bootstrap 3 ready HTML5 Gaming Template. Easy to build your own gaming platform with gameforest. Comes with 60+ HTML files and clean codes. Just copy and paste your favourite sections or elements and build your owns. Blackfyre gives you the power to create massive gaming communities. Users can create clans and challenge each others, keeping track of the matches, share content and much more! Gauge is a powerful review theme that allows you to create extensive reviews for any kind of content including games, movies, food etc. Each review item has it’s own centralised hub page with tabbed navigation where you can display all the news, videos and images relating to that item. Each item can be reviewed by both admins and users and this all comes packaged in a fully responsive, clean and modern design. IndiGamer is a responsive site template based on Skeleton Grid. Are you into reviews? Gaming reviews? Any kind of reviews? IndiGamer is the site template that you need then. Make an impact with Kappa! Kappa is one of premium video game themes designed to empower, inspire, and help express your love for all things gaming. Share your unique passion with the gaming community—create game reviews, highlight the latest gaming news, showcase your favorite fan artwork, market your merchandise, and more! 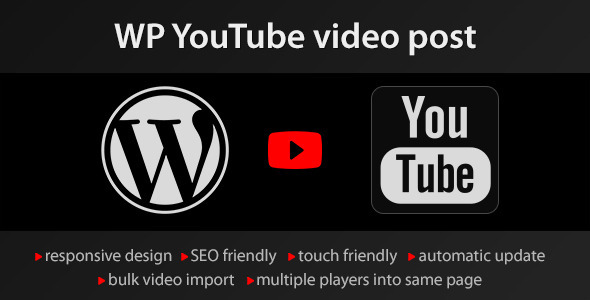 YouTube videos to WordPress posts plugin that allows quick and easy video import into WordPress to create a video blog in a matter of minutes. Compatible by default with 2 video themes True Mag and NewsTube. Here is the tutorial for this plugin: https://www.youtube.com/watch?v=opq9PzhY1go YouTube videos can be imported from YouTube playlists, user uploads or from search queries. You can retrieve any number of videos from YouTube when doing bulk import. Bulk import settings can be controlled to insert all or only some details: ie. description pulled from YouTube can be imported as excerpt, post text or can be skipped altogether. Also, when doing bulk imports, the posts created can have status published, draft or pending, depending on your option. Specific channel support. you can post from any youtube channel by keyword or without filtering. Specific playlist support. wordpress automatic can post from any specific playlist. Full video description support. wordpress automatic can grab the full description from youtube for the posted video. Post Youtube Tags as Tags. wordpress automatic can fetch the tags for the video and set these tags as wordpress tags. Post Youtube Comments as Comments. 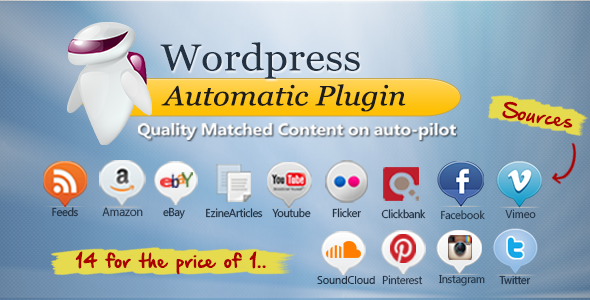 The plugin can grab the video comments and post them as wordpress comments. Relivance to specific language and country. Videos relivance can be set to a specific language and also to a specific country. Auto play videos. posted videos can be auto-played. Various Filters. Lot’s of filters like order,category,license,type,duration and definition. Disable suggestions. wordpress automatic can disable video suggestions at the end of the video. Skip non-embeddable videos. wordpress automatic can skip videos that are not allowed to be embeded. Date control. wordpress automatic can skip videos older than a specific date, post videos with it’s original date or post older items firstly. WooCommerce 2.5.5 slows your site dramatically? 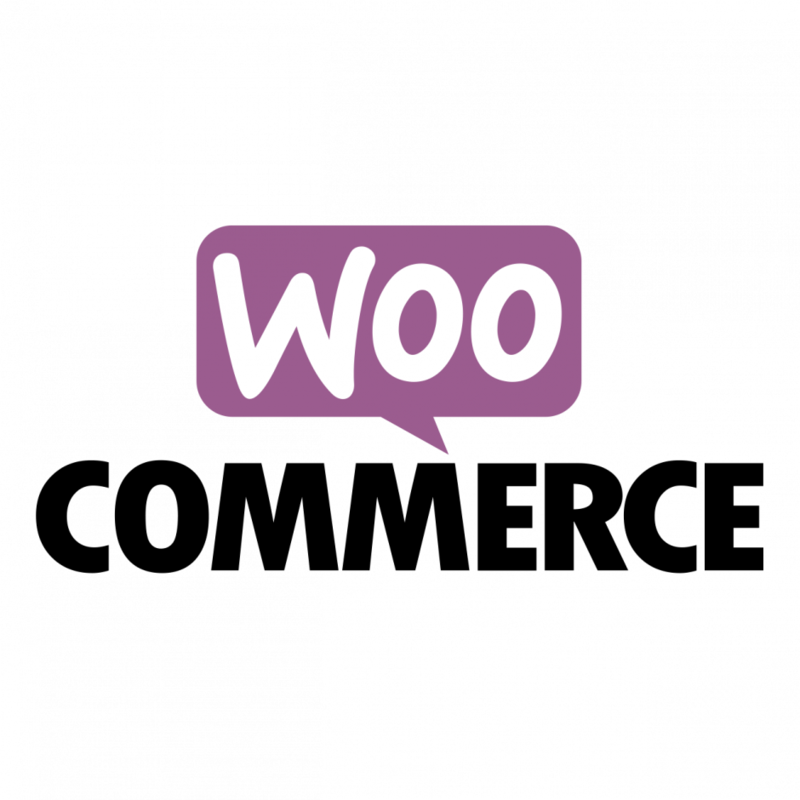 WooCommerce 2.5.5 slows your site, doesn’t it? If you recently update WooCommerce 2.5.5 and you see that your site loads super slow, here’s what to check. The phenomenon is when you visit the site as guests, it loads slowly. If you login and try again, it works normally. Check if this setting is set to Geolocate. When users (mostly guests) do checkout, WooCommerce will try to detect customer’s location using MaxMind GeoLite Database. If this feature doesn’t work well, it will effect your site response. So, try to change Default Custom Address to “No Address”.